Home Boxer dog Care Why Do Boxer Dogs Sit on Each Other? Or Sit on You! Why Do Boxer Dogs Sit on Each Other? Or Sit on You! They cherish to cuddle on your sofa, they tend to behave childish, ooops …., they’ll never grow up; they are sweet rascals always loving to jump on you and sit on you! We’re talking about mischievous and rowdy boxers. A person among us, against whom all the playful facts are not un-folded, might get strange ideas of such boxer’s behaviors, but a boxer dog lover or owner is generally aware of the youthful and childlike demeanor of the boxer dog breed. The most common character of boxer dogs, when they are kept together, they mix up and pile up on each other and there rises a common question! Why they perform or exhibit in this way? Packing together is understandable as and when, there are dogs in larger number in a house-hold, they’ll try to cling with each other to form or uniform themselves in a pack. And when it comes to boxer dogs, they display normally in the same way by sitting on each other. Young ones are especially seen bonded with each other to feel protected and compassion. If they are grown up together, they’ll continue this routine even in their adulthood. This trend is usually observed, when boxer dogs are in relaxing mood. If two of them are resting in this position, the third one will definitely loosen up to join them. Sometimes, it can be a way to display dominance on the opposite fellow. This may be quite hilarious to some of you to watch them assembled in this way! The abovementioned characteristics are frequently common in a multi-dog household but it becomes more interesting, when a boxer dog bounces and occupies your mouth or body by placing itself right on you! If you are sitting on a sofa in your lounge or you’re resting on your bed, suddenly this nutty lad will appear and press itself against your body and will ultimately find a cozy area on you. You please continue what you’re doing. I’m here, just keep patting if you want, otherwise don’t disturb me. Some owners might think, as in such way, the boxer dog is influencing on him. But this is not the case. The fact is, a boxer dog is always in search of achieving the attention and closeness of its owner and this behavior is one of such ways. He damn cares about the load he’s putting on you. He just desires your consideration, infatuation and affection. However, he’ll never understand if he is placing itself on a child. It is you as an owner to train and make him understand, it is not feasible or good for a child. 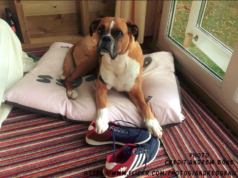 As a boxer dog owner, it is also one of your expectations from your beloved boxer for him to protect your property and family. The best way is to make him understand that all family members are his or her leaders. 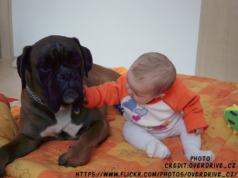 It will be quite difficult for a boxer dog will to change its instinct or habit, better is to involve your children in training and feeding of your boxer dog. If your child is also conversant with the training techniques and your boxer dog is following the “sit” commands given by your child or other essential directions, then it will not become nasty anymore. Instead, your child will also love to get mingled with your boxer dog. Normally, the boxer dog is sensible and intelligent fellow and it will keep the physical size of your child in its mind before getting over-loaded on him or her. 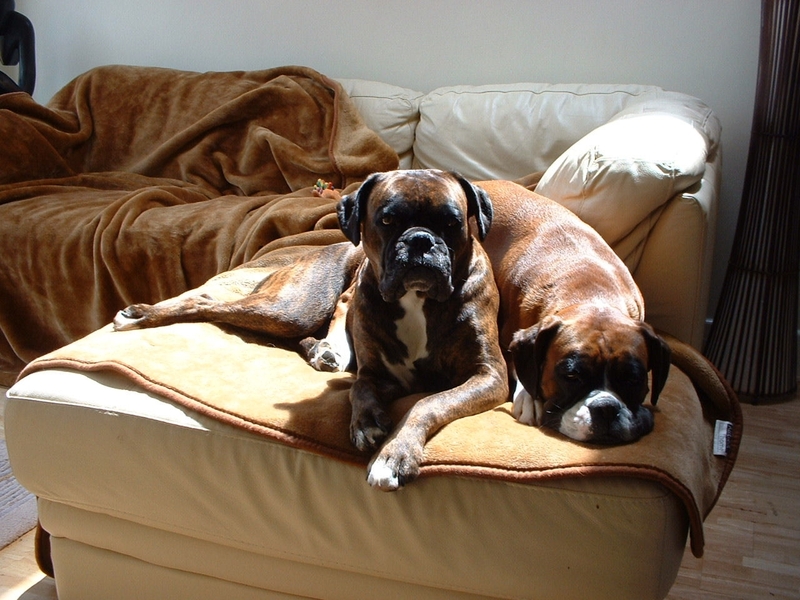 As it is described earlier, in a household, where multiple boxers are kept together, they will normally seen by sitting on each other. Sometimes this playful mate is desirous to play with the other dog and sometimes he’s willing to assert dominance over another. In case of dominance on the other fellow, the behavior may be of various types. If you are letting your dog for insisting on eating first, leading on walks or behaving in the same way in other related acts, the sitting on the other dogs is might be developed in him to express its dominance on the other dog. In a playing mood, the gestures might be different. The boxer dog will keep its ear laid flat and will not create growling sounds. He’ll also keep its tail in normal position, not as erected as if it is aggressive or alert to face a danger. Even if the gaming activity is ended, the boxer dog will end up by sitting on the other. When you have an adult boxer dog grown up by you and if you bring another younger dog to your household, then the sitting on the new one might be one of the ways to introduce him to acceptable attitudes. Young dogs are normally fully energetic and always are in the mood to play. Sometimes the elder boxer dog is not in the mood to be involved in any sport or playing. So sitting on the newer one might be one of the tricks to train him accordingly. With the passage of time, enough training will be given by the elder boxer dog and the younger one will learns the limits. 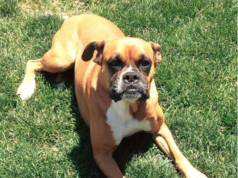 As you know, a fully grown up boxer dog normally weighs between 70-80 pounds, if the newly introduced dog in the household is much smaller than him, it can be harmful for him to sit on the smaller dog or pet. In such case, the role of the dog owner becomes more critical. Vigilance is required in form of training and discouraging the muscular and heavier boxer to restrain himself from doing this. A strict instructions should be passed on the elder boxer and if he sits, then rush to the smaller one and keep it away from the boxer dog’s reach. 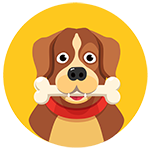 If the problem is continued or such issue is not resolved, then the consultation with your veterinarian or an animal behaviorist can be fruitful. But don’t be harsh on your boxer, as it can shake its confidence.